We are looking forward to seeing our families in school Tuesday and Wednesday after school for the opportunity to meet with your child’s class teacher to discuss learning targets for the year. If you have not got an appointment yet please call in and see your child’s teacher. By working together we will ensure your child reaches their full potential. We would like to say an enormous thank you to all the families who supported the Big Bake sale in school last Friday. Altogether we raised £300 for Help a Hallam Child. We also have a photo on the Hallam FM website. Our school community is so special! On Friday 18th September we are taking part in Hallam FM’s Big Bake to raise money for Help a Hallam Child. You can support this by sending baking in to school on Friday morning for us to sell at social time. If you send your baking in to school in containers you would like back please label them. If you require any further information call in to the office or talk to Jen Delaney. We are also going to be the Hallam FM ‘School of the Week’ so listen out for us on the radio around 7.40am next week. This week every family should receive a DVD called ‘Our Golden Model’ (we will send it home with the oldest child in each family). This is the same film that features on the front page of our website. The film explains the systems we use to keep children safe and support the emotional well-being of everyone in school. The system behind the ‘Golden Model’ was developed by Jenny Mosley and is used by many schools, not only in this country but around the world. We have worked with Jenny since we opened and are the only school that Jenny has done joint training with. Every year we run a training course for other schools with Jenny and she trains any new staff and checks that all aspects of the system are in place. If you haven’t watched the film, we hope that you take the time to have a look at it. The systems in the model underpin what we do at Watercliffe Meadow and make it the special place that it is. Well here we are for the first Golden Time of the new year and this week Mr Read and I are joined by 8 lovely but very chatty Y4 children. 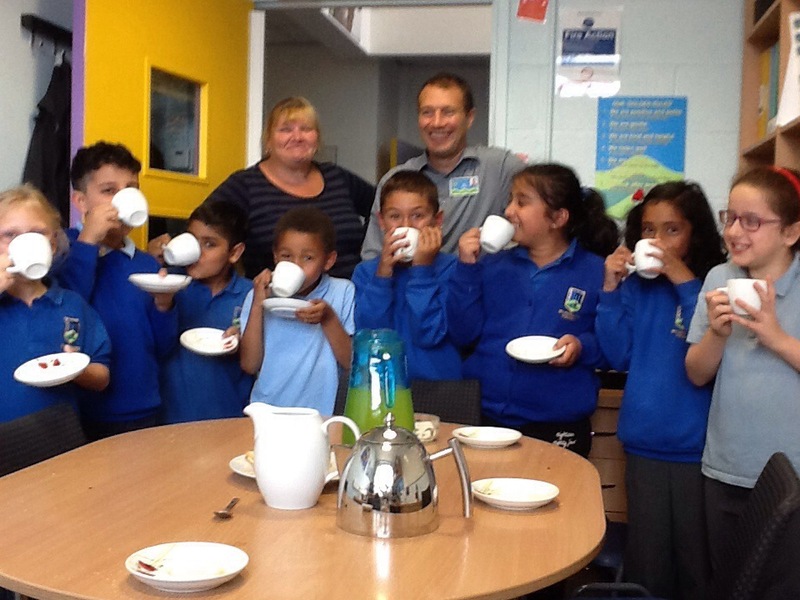 Nine of them have lost any golden Time this week so they all enjoyed tea and biscuits and lots of chatting. We had some funny jokes, some odd jokes and great summer stories. Keep it up! As you will remember shortly before we broke up for the summer holidays we had an Ofsted inspection to ensure we were doing the best for WCM children and families. It was a very intense 2 days with deep scrutiny of policies, practise, teaching and learning. We feel that the report is a fair reflection of ‘daily life’ at Watercliffe Meadow and the inspectors worked hard to capture the views of a wide rage of children and parents in the 2 days they were with us. We are pleased to be able to send out the report with this week’s Green Un and we can very proudly say we are a GOOD school! We are already focused on the next steps to improving our school even further and are excited about the year ahead. If you have any questions about the report please call in to ask someone. We would like to welcome everyone back to Watercliffe Meadow after the long summer holidays. We would also like to welcome any new families to the school, if there is anything you need to know, just ask, staff will always be happy to help. It has been so lovely in school over the last two days. Having all the children back and listening to the fantastic times they have shared with families and friends has been a delight. We have had quite a number of completed Summer Reading Challenges. If you have not yet completed it you have until next Friday, 30 reads earns you a Reading Robot badge! The ‘Mini Adventure Home Learning Challenges’ that have come in to school so far have been amazing. Keep them coming in, it is great to see the fun you and your children have shared over the summer. We want to make WCM the best place possible for your children to attend but we can only do that with your help and support. If you think we are doing something wrong, come and see us with a better idea. Together we can sort anything! Please remember if you wish to see your child’s class teacher to discuss any issues please call to the office and a member of the team will make an appointment.